How to cut a fuel pump access panel/door. if you google the ford clips you will see what they look like , the line in pic 10 has the clip removed and the line is ready to be pulled from the white part . the clips will push into the window in the white part . the clips will be about .040 ( 1mm) wide , but you may get different widths with your fuel pump so you must check the width of the ones you remove . i don't know how to download pics to the forum . i just use picasa and download to my pc . Are you telling me you would press down the red tabs on the old one and withdraw the whole piece ( so the white thing has no red bits left inside ) then slot it again into the new pump ( again use same ebay pic ) and wait for it to click in? That would make some sense. 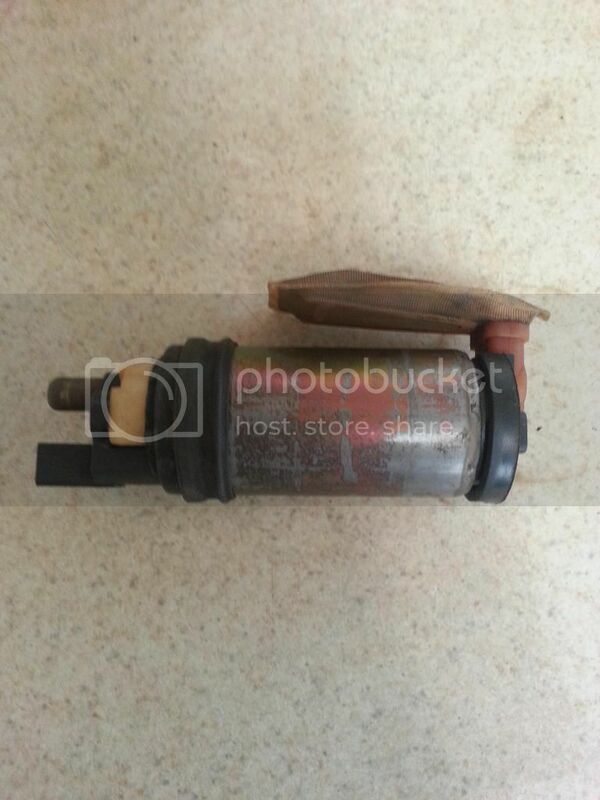 i think i had a different fuel pump , look at the above u-tube , its pretty good . In the end I decided to go for it and make a youtube at the same time - hope this helps somebody out! I became involved in trying to resurrect a dead Focus quite some time ago - it had been driven to its location 2 years previously and left in a garage and simply refused to start. I haven't worked on a petrol engined vehicle since they had carburettors so I was completely at a loss but it had to be moved so it was transported to its new location. I was recently asked to try and get it running so looked up all the forums to look for clues to try and diagnose it. I found that there were plenty of big fat sparks so I knew it wasn't ignition, so I tried listening for the fuel pump priming - nothing heard! I checked the #12 fuse (which was intact) and the cutoff switch by the offside door which was also OK. 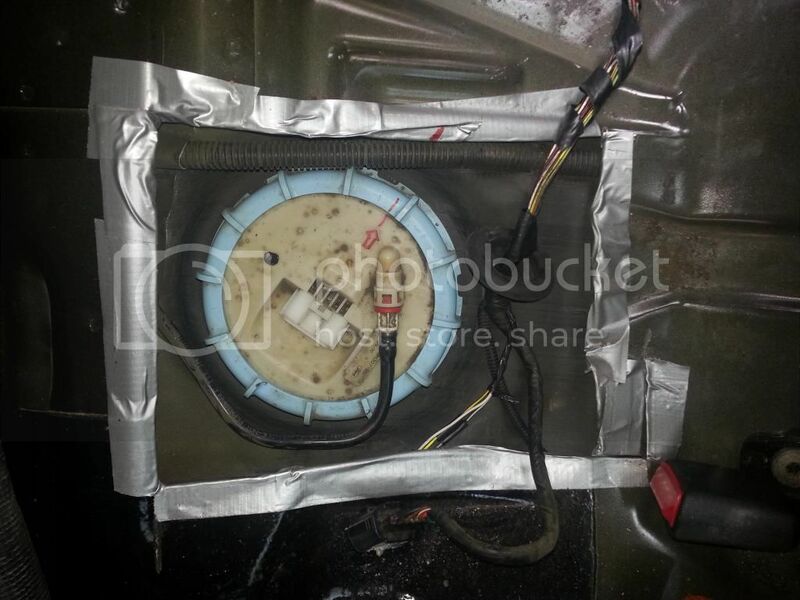 I lifted the back seat and unplugged the fuel pump electrical connection, my multimeter showed that there was power up to the pump so I guessed the pump itself was shot. 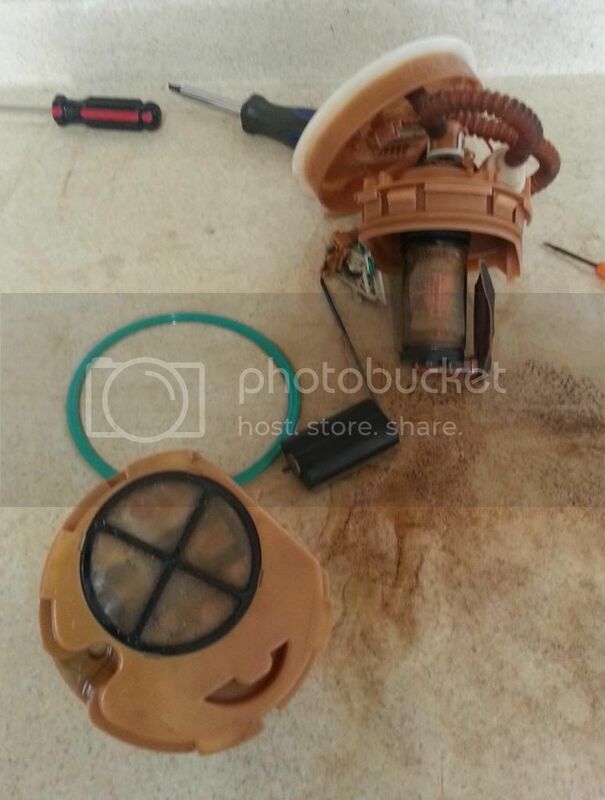 A secondhand pump was obtained, the electrical connection was made and the pump came to life in my hand when the ignition was switched on. So far so good. Access to the car is difficult; there is very little space around the sides and rear; it's wet and cold and I couldn't get in to jack the back end up to drop the tank so I cut an access hole in the back seat area. Mostly because there is no power there, I used a Goscut hand nibbler and finally got access to the top of the tank. It's the same as the one in Purplefocus's video, with feed and return lines secured by the red and white clips. I did what I had to to get them out but fubar-ed them in the process. Fitting the replacement pump was a straightforward job but I discovered that it came without the clips, so I'm unable to finish the job - about 2 minutes work. When I removed the lines from the old pump there were *some* O-rings around the end of the probe which goes in the pump body - they fell off and I collected them as best I could but I'm not sure how many were on each connector. I have them in brown, yellow and white but I think there may have been some in the new pump so I have quite a lot . . .
Can anybody please tell me if the clips for the fuel lines are even available to buy, or do they *always* come with a new pump? And how many O-rings of which colour should there be? Any particular order? discard those rings, I didnt need them. You'll see I dump them in my vid! I bought my pump at eurocarparts and everything was complete. Follow my vid and its explained and dead simple! Thanks for your reply, purplefocus! I only found your video yesterday evening after I'd struggled with the car for a while and I must have missed the bit where you said there were 3 O-rings . . . Although you say you didn't need them, your video says that new ones were pre-installed in the new pump so they are present. The pump I fitted was off eBay and didn't come with the clips at all, but there were a few O-rings floating about which is why I couldn't figure out how many to replace. Your vid says there were three so that's what will go back on! Don't suppose you kept the clips when you changed the pump . . . ? 2 of them broke whilst removing so binned , sorry. IIRC provided the red bit ( as shown in vid are there ) you dont need any of the coloured ring you simply slide the end of the fittings on the fuel pipes in and they click. Thanks anyway!! Useful vid, BTW - even if I did only find it after the event! made the access door . cleaned the tank and the fuel pump.My pump is the old type where the base has to tightened to the floor of the tank.. .
My fuel pump is the old type ( prior owner did not change it during the recall period). For me to put the new type I will have to cut out the old fuel pump holder from the tank and buy a new fuel pump housing.For the time being I will fill my tank when it reaches the halfway mark. Last edited by carzts; 05-20-2014 at 11:29 PM.